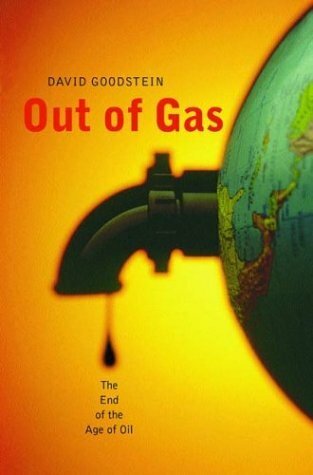 Over the course of a couple hours (spread over yesterday afternoon and this morning), I read Out of Gas by David Goodstein. It came highly recommended by an astrophysicist friend of mine, and was loaned to me by a fellow climate scientist. Many of you may have already read this very popular book, but for those of you who have not, I can only say it is worth the couple hours. The subject matter is not cheery. Subtitled, The End of the Age of Oil, Goodstein quickly describes how M. King Hubbert predicted the end of the USA's oil dominance in the 1970s two decades in advance, and goes on to explain that the same factors are beginning to come all too clear in the world oil resources. Goodstein is a physicist, a distinguished professor at Caltech, and has written several books and hosted The Mechanical Universe for PBS [additional bio]. He doesn't work for the oil companies, and neither does he owe loyalty to the Sierra Club. I wouldn't be surprised if he does become a member of the Union of Concerned Scientists at some point, though. The book is political only after it makes its reasoned, scientific arguments. Essentially Goodstein recognizes the impending global energy crisis, makes conservative estimates of how far away this crisis will be (following the more statistically and logically sound reasoning of Hubbert and followers), and concludes that the world can't keep going like this much longer. We must find an alternative to fossil fuels. Keeping a strong grounding in fundamental physics, giving some of the relevant physical and historical context, Goodstein reviews the pros and cons of known alternatives, and finds all of them lacking. Out of Gas is a call to engineers, physical, social, and even life scientists to wake up and start to address this problem immediately. The stakes are high, and the rewards of successfully averting the coming catastrophe are even greater. An aspect of this book that I can't help but give some bonus attention is the way all the arguments are based on fundamental, freshman-level physics. A quick look using a popular search engine for either "David Goodstein" or "Out of Gas" or both shows no immediate negative response. Books that politicize or over-dramatize these issues, or are written by non-experts are routinely criticized by right-wingers and nay-sayers for (generally) ridiculous reasons. Having simple arguments using basic physics written by an established, respected physicist lends credibility to Out of Gas unknown to many of the book's peers. In my experience, people arguing against alternative energy or global climate change (also touched on in the book) try to confuse the issues with circular or wrong-minded refutations, but it is harder for them to do so with such clear arguments. So go now, and read this nice little book. Pass it along to your friends and colleagues. Let's start working on this before the worst case scenario befalls us, and we are sent spiralling into a Mad Max world of regional warlords fighting for water and oil, with widespread hunger, murder, and misery. Yes, we really are talking about the fate of our entire species. Thanks for the rec, I blogged it! I wonder how we can effectively get this book in the hands of the people who really need to read it. It seems like this kind of knowledge accumulates in excess within a narrow band of people--which narrow band happens to be clumped together in both real-space (the coasts) and degree-space (science-literate folks, like you and me.) I'm trying to think of various ways of breaking out of our little clusters and let this knowledge dilute out into wider society. Your call to pass this little book on is getting me thinking about this, because to whom should I pass it on? "we don't need another hero... "